I spent a little while today updating my important information sheets. I like to have a hard copy of all this information in case my phone contacts are lost, or to bring into doctors, etc. I organize medication first by prescribing doctor – I have 2 that prescribe me medication, and I take some over the counter. Without divulging all my personal information… This is what part of my medication sheet looks like. The next page included all my doctor’s information. Besides my current doctors, this also included my pharmacy and lab. Information included were the name of the doctor, name of the clinic, address of the clinic, and phone numbers including fax. Employer information: I work at a school. I included the phone number/address of the public school HQ and the specific school I work at, as well as the phone numbers for my 2 direct bosses. I also babysit. 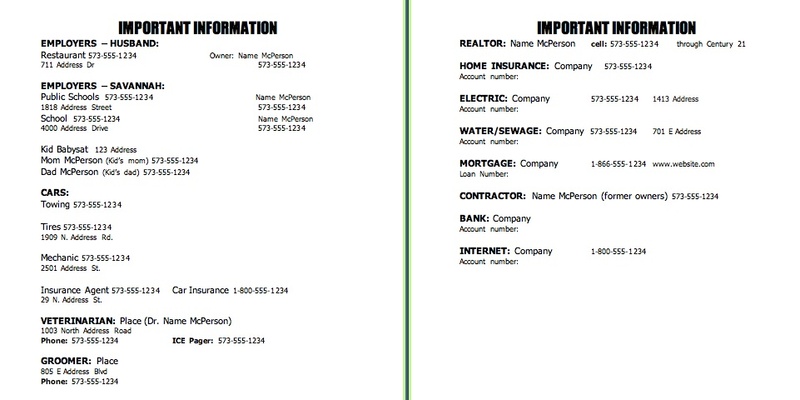 I included the address of the home and both parents’ phone numbers. Husband works at a restaurant. I included the phone number, address, and the phone number of the owner. With all applicable situations, I included the account number. I thought it would be easier to have all the information in one place instead of having to search through old bills for any account numbers. I had a hard enough time finding the bills for account numbers and phone numbers just to update this list. I keep these papers in a binder and the files stored on my computer. 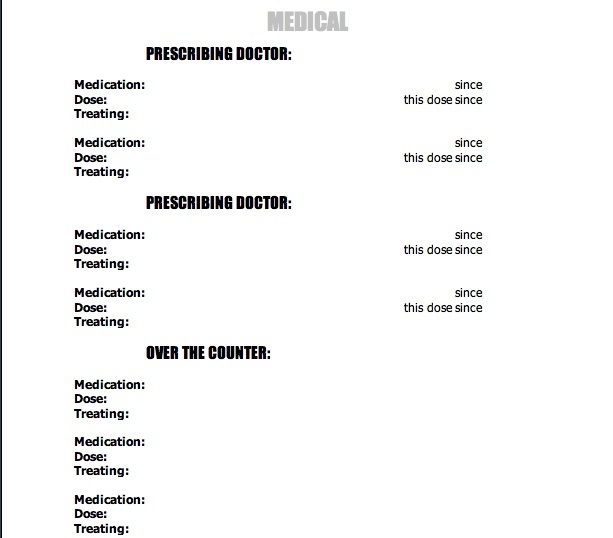 When a main doctor retired recently and I searched high and low for a new one, it was very helpful to have my medication list to fill out all the paperwork. Also, when I washed my phone in the washing machine not too long ago (whoops! ), it was great to have the most important phone numbers written down so I could easily put them in my new phone. This was particularly helpful with employers’ phone numbers. Is your important information organized? This entry was posted in Organization and tagged 3 ring binder, bills, binder, information, medical organization, microsoft word, ms word, organization, organize, organized, organizing. Bookmark the permalink.